Prime95 and IntelBurnTest, along with capturing y-cruncher and Cinebench scores, and running 3DMark at Extreme settings. ok this might be a really stupid question but whats the benefit of manually setting the voltage? I usually keep it at auto with the load line freq at high or above. I've managed to get stable 4.8Ghz overclock's with my I7-2600k but I've never bothered to go any higher due to heat issues. Shoot me if I posted this in the wrong place. Auto usually overcompensates on voltages to ensure stability. Manually setting the voltages allow you to find the bare minimum voltages needed to find stability. Being able to use less voltages allows lower temperatures and power consumption. Ahh I see I'll make a note of that for future overclocks. Thanks! 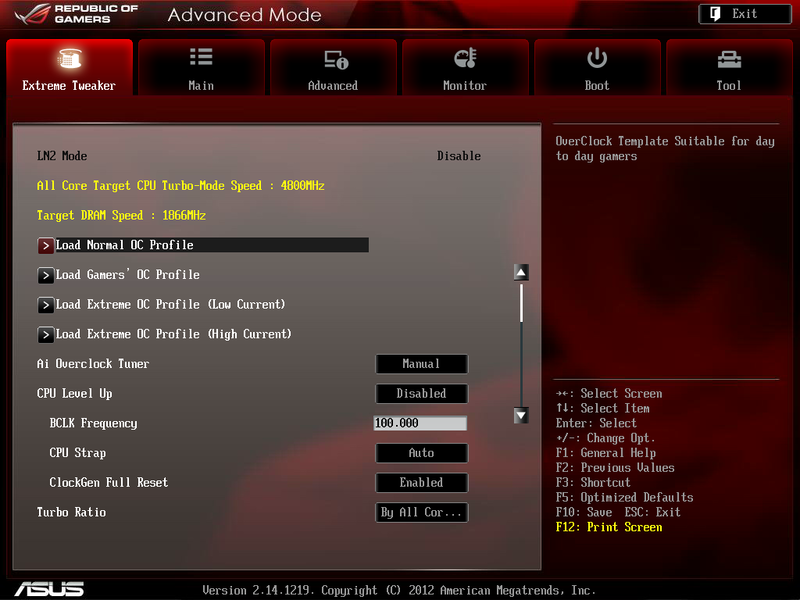 Most of the time, Auto setting is bad, actually very bad for good overclocking (i.e. >4.6GHz in SB i7). Is there anyway to save your bios settings before you flash new bios ?? Never saw this post, sorry for the late reply. No, you can only take screenshots (F12). Almost every new BIOS update may affect your overclock settings, so it's good to finalize your overclocks and test all over again with a new BIOS. Some BIOS updates I can't keep 4.8GHz stable at 1.38Vcore, some I need 1.45Vcore, etc. Updated with latest 3301 BIOS. The photos that you are have on the first page are from bios 3301? 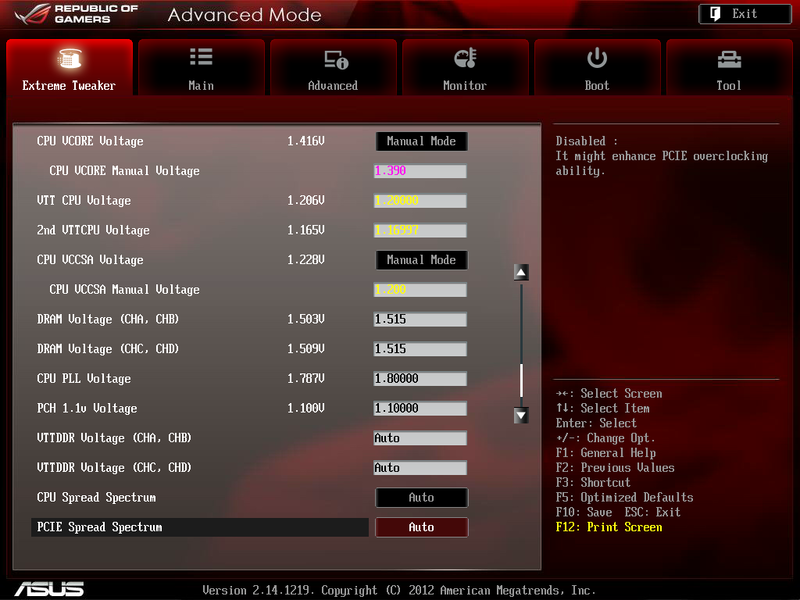 These are my settings with BIOS 3301(different BIOS update may affect your overclock). Keep in mind, these are high overclock settings with my CPU, Motherboard, and Graphics cards cooled using a custom watercooling solution. 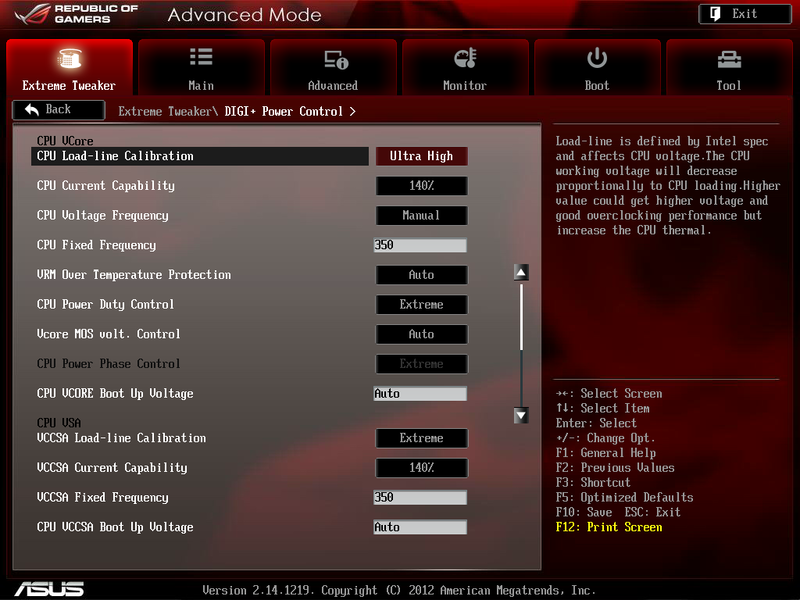 Do not attempt these overclock settings with air cooling. This is for my 4.8GHz Overclock. I have a mix of 6 x 8GB G.Skill Ripjaws X's and 2 x 4GB Samsung Extreme Low Voltage RAM. I keep the timings at the default timings for the G.Skill Ripjaws X's. CPU VCORE at 1.39 during load using Prime95 will report in CPU-Z 1.440 - 1.448V's with my Load Line Calibration set to Ultra High. It idles as low as 1.416V's in CPU-Z. This may be reported differently based on your CPU, Motherboard, Memory, BIOS, and/or settings. I have two systems nearly identical, and they report things slightly differently. You don't want to chance anything higher than 1.4V's for supposed degradation, but I've not experienced degradation, yet. VTT CPU Voltage needed to be increased to 1.2V's for better stability to my memory and graphics cards. 2nd VTTCPU Voltage doesn't need as much of an increase, I keep it at the 1.16997 to prevent 0x09C BSOD's. Not sure why, but it's helped prevent it for me. CPU VCCSA Manual Voltage at 1.2V's is enough for 58GB's memory at 1866MHz helps. DRAM Voltage at 1.515V's even though it only needs 1.5V's. I add 0.015V's for compensation. CPU PLL Voltage while I could go as far down to 1.55V's on my SB system, it's probably more reliable to keep it at 1.8V's. PCH 1.1v Voltage doesn't need to be raised unless you have multiple high-end graphics cards and also overclocking them. It's optional if you want to disable CPU and PCIE Spread Spectrum. I manually set CPU Ratio to 48 and leave everything else alone. I prefer my CPU Load-line at Ultra High rather than Extreme. CPU Current Capability I can set at Auto or 120% for 4.6GHz, 130% for 4.8GHz, and 140% for 5.0GHz. I set mine at 140% at 4.8GHz. 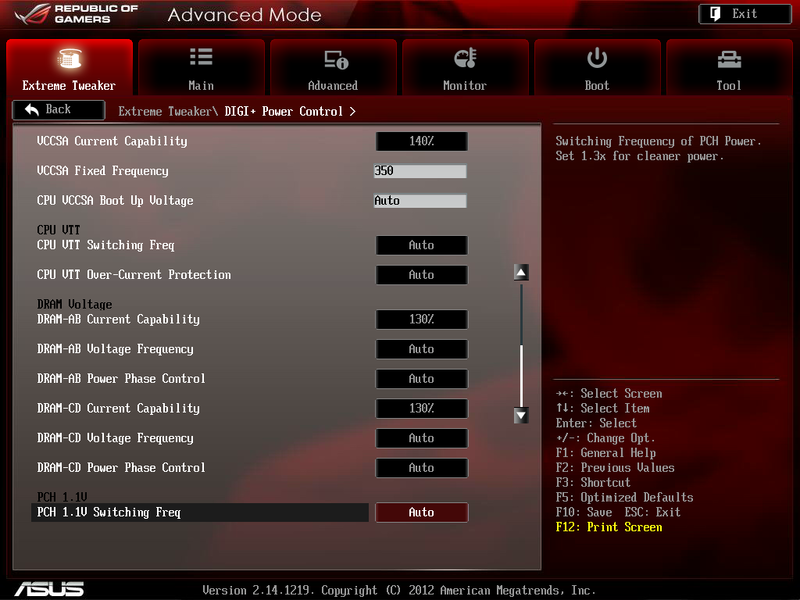 CPU Fixed Frequency Manual set at 350. CPU Power Duty Cycle set at Extreme. CPU Power Phase Control set at Extreme. VCCSA Load-Line Calibration set at Extreme. VCCSA Current Capability set to 140%. VCCSA Fixed Frequency Manual set at 350. DRAM-AB Current Capability would be fine at 100% - 120%, but since I've got a lot of memory, I set it at 130%. DRAM-CD Current Capability is also set at 130%. I believe the only thing I turn on is Intel Virtualization Technology, and currently that's default Enabled. If you don't have a need for it, you can leave it disabled. I use Virtualization Technology, so I keep the Intel ® VT-d setting Enabled. Leave it disabled if you have no need for it. If you have an SSD, then use ACHI Mode. If you don't, then IDE Mode is fine. If you want to eventually setup a RAID array, then choose RAID Mode. Just my personal preferences for Boot-up settings. Anyone have any questions or suggestions for improved settings, let me know. I have Asus rampage iv extreme and i bought kingston 32 4*8 GB ram 2400 MHZ. The problem is in cpu-z the speed showing 1333 mhz and i try to change from BIOS also and i changed it after i again checked in cpu-z its showing the same 1333 mhz. I again went to BIOS inm extreme tweaking tab its 2400mhz but when i go to MAIN tab its showing there 1333mhz. i am not understanding why this happening i also enabled XMB but nothing change. Please guys help me.